Contemporary heart pattern wedding invitations white-black-red in colour coming in a white striped pearlised board and your personalised wording printed on rice paper plaque stitched with red string and a hearts pattern. Your personalised invite is printed in plain black colour. The matching square envelopes are white pearlised paper. Size: 15 x 23 cm. 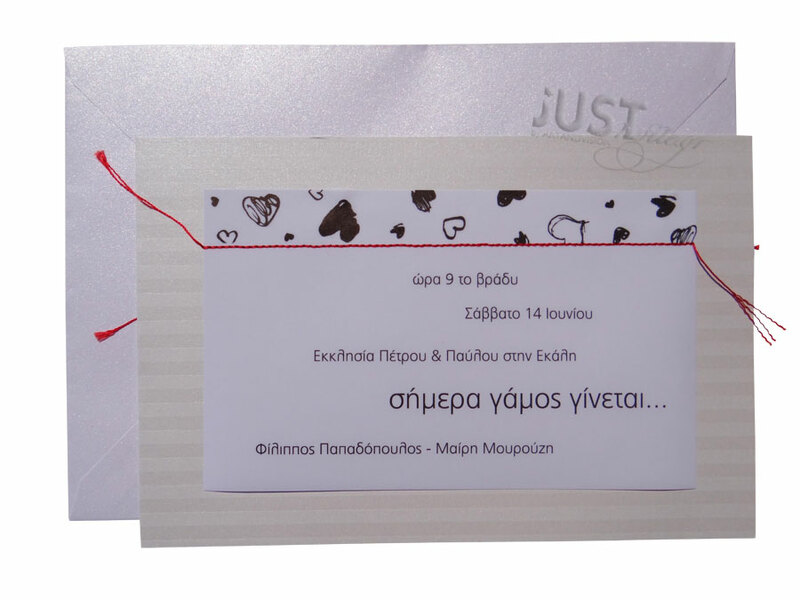 https://www.preciousandpretty.com/2017/10/wedding-invitations-with-hearts-A1004.html Greek Wedding Favors|Orthodox Crowns|Stefana|Baptism Invitations Wedding invitations with hearts A1004 Wedding invitations, contemporary chic, with a hearts pattern, stitched with red string. Product #: Greek Wedding Favors|Orthodox Crowns|Stefana|Baptism Invitations_859980511195430956 5 stars out of 5 reviews.